While in Martha's Vineyard last week I saw a really interesting store window display . It was just a large piece of white paper with Christmas themed block words cut out into it. It looked really nice during the day and seemed like a pretty simple concept. I decided to try it. I used black photo backdrop paper. If you don't happen to have photo backdrop paper you can also just tape together large sheets of newsprint paper. It does leave a lot of room for people to see into your house though so I would probably do it in a room that you aren't going to be in very much. Cut out your letters. I used our Silhouette machine to cut out 12"x12" cardstock paper that I wasn't going to use. Remember you only have to cut out each letter you use once. 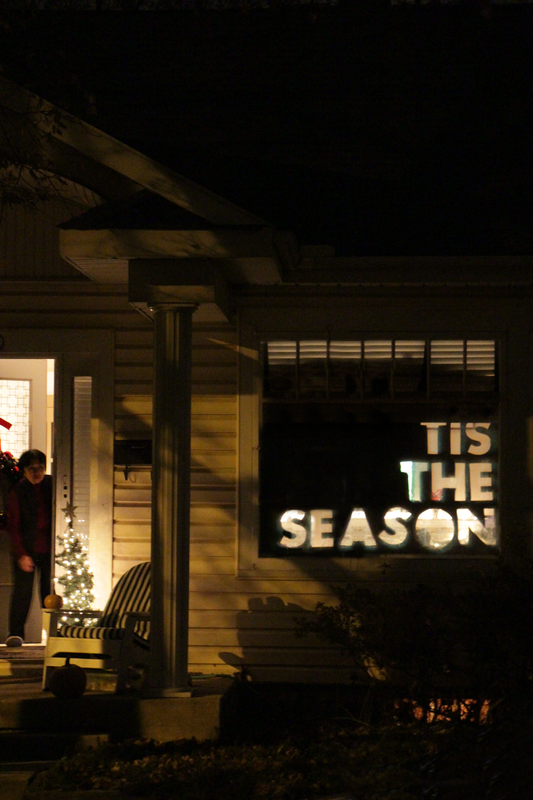 For "Tis the Season" I only had to cut out 8 letters. Lay them on your paper and trace.